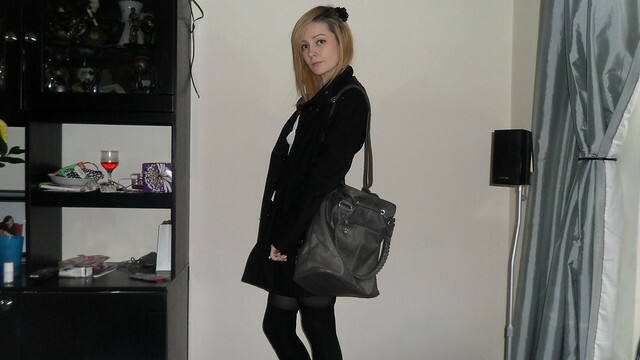 So todays outfit, has a majorly simple colour scheme. Black, white and two shades of grey. 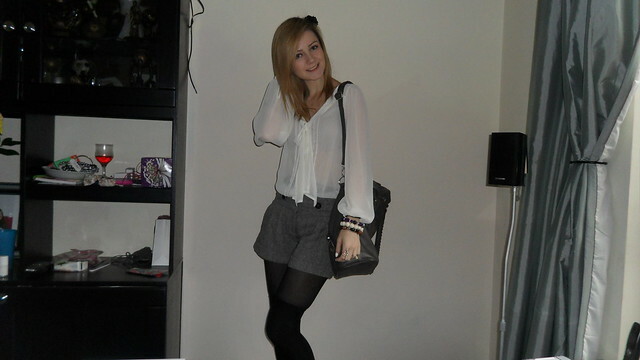 I actually love this outfit, quite sophisticated and i think i've managed to achieve a girly look again, yay! This blouse is another purchase off Ebay. I was determind to get this when i saw it, it's a creamy/white colour and i've wanted a pussybow blouse in this colour for ages, my final bid was £15.03 and i managed to win it! 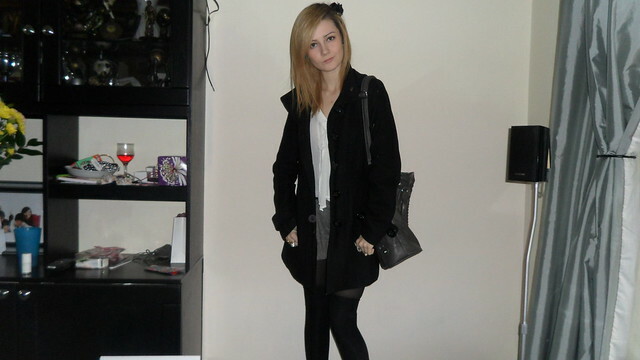 So happy that i finally have this in my wardrobe, so versatile and goes with more or less anything, perfecto! 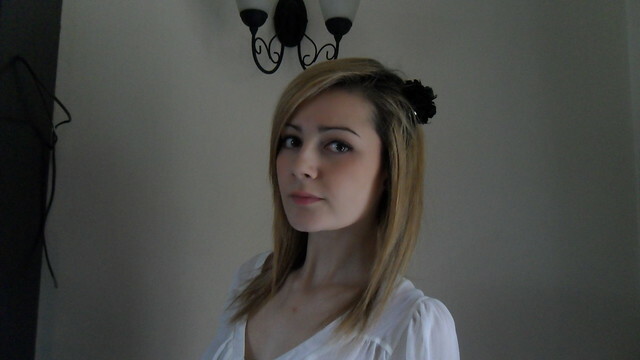 I've come round to the idea of wearing accessories in my hair, so after searching through my room i found this little black clip-in flower white i've placed nicely on the left hand side of my head, it's just a bit different i suppose. For a bit of colour to this outfit, i mix and matched 3 bracelets one brown, one purple and one cream, i'm also wearing 3 rings. This bag was a present from my brother for my Birthday, it's grey leather and just lovely. It's got 2 handles or a over shoulder strap which you can attatch or remove. I just love it! ﻿Plan to spend a nice evening in with Sam tonight, bought him all his favourites for dinner, (a fillet steak) and some other bits & bobs, goign to let him cook that when he gets to mine, we both know i'd probably wreck burn it or undercook it... either way, to avoid food poisoning probably best if he cooks it haha! Think we may go to the cinema and get a coffee or something, but not entirely sure yet. Then back to mine to chill with a DVD and some drinks. I bought Despicable Me on DVD, and still haven't watched it yet, but i'm determind to get him to watch it with me tonight, even though he refuses! I've seen some trailers of it online, and i just want to watch the part where the little girl screams 'IT'S SO FLUFFY' makes me laugh so much! You can watch the trailer here, trust me.. you'll laugh for ages! I can't wait for my room to be done up, when my dads back feeling a bit better he's going to finsih putting the mirrors on my wardrobe, move my bed, finish painting the walls, get the dressing table from the garge and paint/varnish it. Then i need to empty my desk and bed side table and throw away mountain loads of stuff. Then he can paint them. Then go through all the clothes in my chest of drawers and all my other clothes to find space for all the clothes in my chest of drawers as we're getting rid of that. Then my shelves are going to be painted and my curtain rail. Then it should be FINALLY finished and i can start to order some stuff! Need to order and find an armchair, a mirror for my dressing table, some photo frames, new bed covers and new curtains. Then my room will be finished completely and look nice enough to actually spend time in! Will be sure to take lots of photos once it's all finished! It's going to have a nice monochrome, vintage feel to it! And that nail polish looks so cool! Models Own always have those beautiful colors! Great outfit. I love your rings. Gorgeous outfit, love the blouse!! The white nails go great with this outfit. im loving the shirt. and the outfit is flawless. Love this outfit! The blouse is so pretty and airy, it looks gorgeous on you. Have a great weekend girl! adorable like always. Loving the above the knee socks!! You are so beautiful! I love that you put leggings and socks on! gorgeous outfit! i def love your white blouse, it's just perfect! we could follow each other if you want! Love this look. I'm really loving your blouse. It looks so pretty on you. Great outfit!! I love the blouse and your nails colour!! !Nice blog! i love the white nail varnish! think i'm going to have to invest in some myself! lovely blog i love your style! i can never get enough white when it comes to nailpolish. it looks clean and refreshing. I know Potter's Bar! Used to go there a lot when my Gran lived there - isn't far away at all.